… he had begun to wonder why the great feats of magic that he read about remained on the pages of his book and were no longer seen in the street or written about in newspapers. I finally finished the book, yay! I have started to read JSMN last March for buddy reads and it took me quite long to finish all 1000 pages. Set in England during the 19th century, the book narrates the story about how magic is being revived by Mr. Norrell and his student Jonathan Strange. There are a lot of challenges in restoring magic to be a respectable profession in England and the differing perspectives of the 2 greatest English magicians is one of them. The book is divided into 3 parts, each a continuing story from its previous which I think can stand alone as separate books. If you have the physical book, you’ll know what I mean. Having everything in one is quite a burden because it’s quite bulky and heavy, hehe. Anyway, since each part is quite long, I think it would be better to discuss each to avoid confusion. Apart from the book being long, I have already mentioned in my previous post that I have watched the full series of JSMN, so I may also have comments regarding the series VS the book every now and then. The first part of the book takes us to Northern England where the Society of York Magicians discover that there still is a practicing magician, Mr. Gilbert Norrell, who has a vast collection of books of magic which the Society is very eager to borrow and learn from but Mr. Norrell opts to keep them away from it. The Society then asked of Mr. Norrell to prove his skill which he eventually does at the expense of every York magician’s approval to resign from studying and practicing all forms of magic (with the exception of Mr. Segundus, who did not sign prior). After the incident, Mr. Norrell has put upon his hands to revive respect for English Magic and moves to London to further pursue his cause. In London, he meets Sir Walter Pole who is married to a sickly, Mrs. Emma Pole who then dies. Wanting to strengthen ties with people in the government, Mr. Norrell attempts to summon Mrs. Pole from the dead which he did so by striking a bargain with a fairy (also known as the gentleman with thistle-down hair) and resulting to Emma spending half her life normally and half spent with the fairy. I found the beginning of the book interesting. It opened with information about what magic is all about. I especially loved the scene in the cathedral which I find very fulfilling to imagine. Mr. Norrell as a lead character is annoying. I don’t like his self-righteous attitude towards being a magician. He is very selfish and arrogant and I found great dislike over him when he asked the Society of York Magicians to give up being magicians. The gentleman with thistle-down hair is an interesting character. He really doesn’t have a name and for a fairy, he seems quite scary. We’re all familiar with children’s fairytales but this is far, far from what a fairy we expect to be. Footnotes!! I feel taken aback with the number of footnotes in the book. A footnote can be written off as a short story! The footnotes were a different side story altogether and can take you away from what you really were reading. It’s too long and too deeply informative. I don’t see the point of explaining and retelling every little detail. A simple explanation would have sufficed. As the story progresses, there are chapters which I find dragging and and chapters which engages me to read further more. There are a lot of characters introduced every now and then and it was quite hard to follow who the characters were. This is only the first part of three volumes so expect more characters to come in later on. In the beginning of Volume 2, a background on Jonathan Strange has been narrated. Mr. Strange and Mr. Norrell also met and immediately had a misunderstanding regarding the importance of the Raven King in relation to English Magic. Mr. Norrell, who was a suspicious of Mr. Strange asked Mr. Strange to perform a magic in front of him which Mr. Strange successfully does and was taken as Mr. Norrell’s student right then and there. Due to the ongoing war with the French, Mr. Strange was asked to help the army. Meanwhile, Arabella, Jonathan Strange’s wife, befriends Lady Pole and learns of Lady Pole’s weird stories (which was supposed to be Lady Pole telling Arabella her half life being forced into dancing in Lost Hope). Arabella also meets the gentleman with thistle-down hair who then takes a liking to the lady. When Mr. 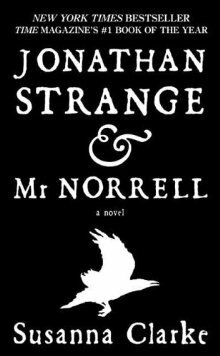 Strange comes back from the war, his misunderstanding with Mr. Norrell continues which causes him to completely part from his teacher and return home and write his own book. The completion of Mr. Strange’s book has been his priority and he falls behind not noticing his wife, Arabella, missing. He looks for her but Arabella reappears weak and shaken but dies three days later. As Jonathan Strange was being introduced, it was clear that he was supposed to be the complete opposite of Mr. Norrell. He is young and inexperienced as a magician but has the confidence to do things outside the book. As Mr. Norrell is annoying, I can simply say that Mr. Strange as a magician is more likable in terms of how he handles his affairs although at times there is also an air of over confidence in him. It was interesting to see how Lady Pole is coping up with her new life. It was never easy for her being thrown into Lost Hope when she appears to be resting in the mortal world. And it was quite a surprise how she seems to be telling her woes to a confidant but end up saying nonsense stories to another’s ears. This detail was a bit unexpected and a brilliant idea. I know this volume was supposed to be the highlight of Jonathan Strange’s skills as a magician as he showcases his powers during the war but I found it a bit ineffective. I found the chapters about the war dragging (since I am not a fan of war stories) although there are some feats that were great. Arabella’s demise was a bit of a surprise ending. It was a major cliffhanger and made me want to start the third volume right away. Again, there are a lot of characters introduced in the volume which was difficult to keep track of. I think there are too many complex characters and a lot of background details about them and makes you think whether these characters and these detailed information about them would be necessary to the overall story. There are just too much for me to grasp. I don’t know, maybe it’s just me though. Lady Pole attempts to shoot Mr. Norrell but Childermass (Mr. Norrell’s assistant) has prevented her from doing so and gets shot instead. After the incident, Sir Walter Pole decides to take Lady Pole to the country to be cared for in an asylum headed by Mr. Segundus. Mr. Strange, torn because of Arabella’s death goes to Venice and befriends Flora Greysteel. He tries to experiment with dangerous magic in an attempt to call a faerie and revive Arabella. One day, Mr. Strange successfully gains access to Lost Hope and discovers Arabella alive. The gentleman with thistle-down hair discovers Mr. Strange in Lost Hope and curses Strange with Eternal Night. Mr. Strange goes back to London and asks Mr. Norrell for help and they try to summon John Uskglass and break the curse to free Arabella. The third volume was definitely better than the sec0nd. I find this more engaging and exciting. Again, new characters were introduced in the final volume. The Greysteels were not major characters but at least their presence in the volume was needed for the story. It was revealed here how some key characters were plotting schemes all along. The revelation of Lascelle’s selfishness and Vinculus’ prophecies were dramatic but effective. If there was a let down in this chapter, it would have to be John Uskglass/ The Raven King. His character was already built up from the beginning of the novel, he was described as this powerful magician who has control even on faeries. I was actually waiting on his appearance but it was a bit of a let down when he finally appeared. It felt anticlimactic. He was not the all-powerful king I was hoping to appear and redeem everything. His presence and power was shown very vaguely when he was summoned by Mr. Norrell and Mr. Strange. Sad. I loved the ending though! After being trapped in Eternal Darkness together, Mr. Norrell and Mr. Strange became urban legend for the English Magicians. It was not clearly stated what happened to them after summoning the Raven King. Their cause which was to revive English Magic was finally fulfilled although not the way Mr. Norrell hoped it would be – the revival of English Magic resulted to the awakening of powers in certain individuals. Overall, I enjoyed the book save for the footnotes. Sorry, I’m not really a fan of those footnotes. I found the book intriguing enough to make me read more. For a fantasy book, I don’t think it fair to be compared to Harry Potter because these two fantasy books are entirely different from the other. JSMN, I think is more for the serious/mature readers who is not into the fancy YA fantasy genre. After reading the book, I look back on the mini-series and agree that the TV adaptation gave justice to the book. This entry was posted in Read It and tagged alternate history, books, fantasy, read it. Bookmark the permalink.